Figure 1. A new crane laboratory at NTNU, Trondheim. The construction of the new crane laboratory at NTNU, Trondheim has been finalized. 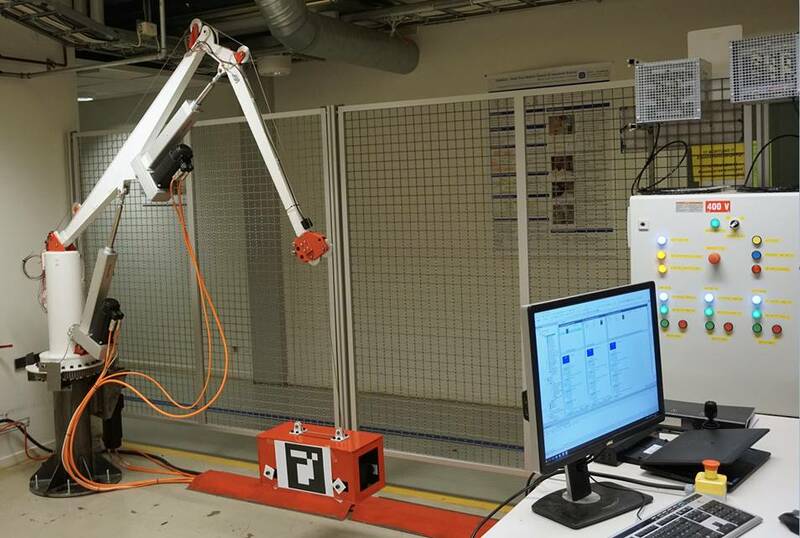 The laboratory features a down-scaled version of a knuckle boom crane, which will be used for testing and developing control and estimation algorithms for offshore operations. The PhD candidate Andrej Cibicik (NTNU), who is responsible for the design and assembly of the laboratory, thinks that the research results will provide significant value for the industry. – The lab itself was built from scratch, so I had a lot of flexibility to make it as versatile as possible. I decided from the start that we should have industrial control hardware in the loop, so that our implementation schemes can be easily transferred to industrial applications. I think that our group at NTNU has achieved a very good theoretical level in the areas of modeling, control and estimation. The next step is to demonstrate to the industry partners how the equations work in practice. Today, the safety and feasibility of offshore crane operations depends very much on the skills and experience of the crane operator. With this new laboratory we can test and benchmark different automated control approaches for performing safe crane operations in demanding conditions. Andrej Cibicik is collaborating with his colleagues Aksel Sveier (NTNU), Alexander Meyer Sjøberg (NTNU) and Geir Ole Tysse (NTNU). Professor Olav Egeland (NTNU) is the leader for the working packages WP2 and WP4, he is positive about the collaboration between the PhD candidates. Figure 2. PhD researchers: (from left to right) Alexander Meyer Sjøberg, Geir Ole Tysse, Aksel Sveier and Andrej Cibicik. – We want to study possibilities of damping the sway of the payload at the specific position, as well as possibilities of following trajectories while minimizing the sway of the payload. My own research is mainly focused on modeling and control, but the controller is dependent on measured or estimated systems states. Some of the states are very difficult or even impossible to measure, here a reliable estimation procedure comes into play. Luckily, I have several colleagues working with advanced estimation and filtering. Aksel Sveier is working on implementation of 3D vision sensors and sensor fusion for offshore applications. He thinks there is a large potential for the technology in the industry. – My research is focused on estimating and tracking position and orientation of dynamic objects and systems using mainly 3D vision sensor technology. The 3D camera enables us to track virtually any object (or several objects) even in poor lighting conditions. We have already conducted several experiments in the lab where we have tracked the crane load using a 3D camera. Potentially, we can also track other equipment and personnel on the drill floor thanks to the flexibility of this 3D vision system. In addition, the estimation and filtering techniques I use enable sensor fusion with other sensors, such as 2D cameras and IMUs, so we can achieve the robustness that is required in an offshore operation. Alexander Meyer Sjøberg and Geir Ole Tysse are looking at the alternative solutions for tracking of the crane payload. – We are looking at the application of 2D vision sensors for object tracking in the context of motion compensation. The 2D cameras are known to be very precise sensors under favourable conditions, however the implementation is challenging for real-life cases. We want to investigate the robustness of the technology on its own and in combination with other sensors. The price of the 2D sensors is relatively low and they can easily be mounted on the crane boom or any suited location on the ship to track the motion of the payload, or the other vessel. Center leader Geir Hovland welcomes the new lab facility at NTNU. 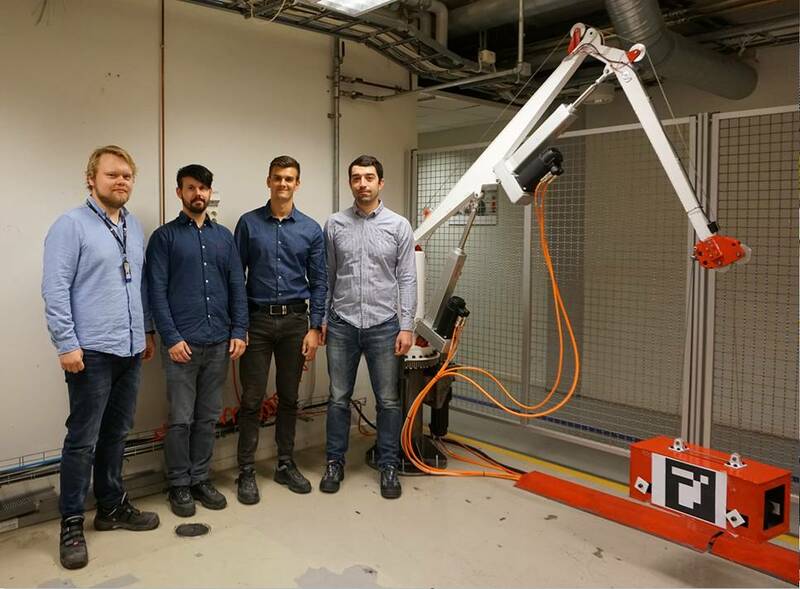 The work done on sensors, sensor fusion, algorithms and the scaled-down knuckle boom crane is highly relevant for the research centre SFI Offshore Mechatronics and it’s industry partners.